Why is Portland weird? What is Keep Portland Weird? Portland has always been a haven for weird people and weird events whether it’s the infamous Portland postman who pooped on a patio a few years ago, the zombie-filled car that crashed on a freeway, or the extremely popular Portland Saturday Market which attracts crowds of oddities. Regardless, Stumptown’s an odd burg, and here we’ll talk a bit about why it’s so weird and also where the heck the whole “Keep Portland Weird” phenomenon started in the first place (Hint: it wasn’t Portland’s first). Believe it or not, the “Keep Portland Weird” concept didn’t start in Portland, it started in Austin, Texas with “Keep Austin Weird,” a motto intended to increase traffic to local businesses. Since then, like Portland’s residents, Austin’s citizens use the slogan to refer to all aspects of their city. The “Keep Portland Weird” movement started when Terry Currier, owner of the famous music store Music Millennium, learned of the movement and brought it to Portland in 2003. In 2007, he even trademarked the phrase and started printing up bumper stickers, selling more than 10,000 by the end of that year! Now, you can buy a variety of items with the phrase on including t-shirts and, yes, still more bumper stickers. There have been a number of other imitations since – “Keep Portland Wired” and “Keep Portland Beered” come to mind – but one thing’s certain: Portland is weird and that weirdness is one of the reasons everyone seems to love it here. 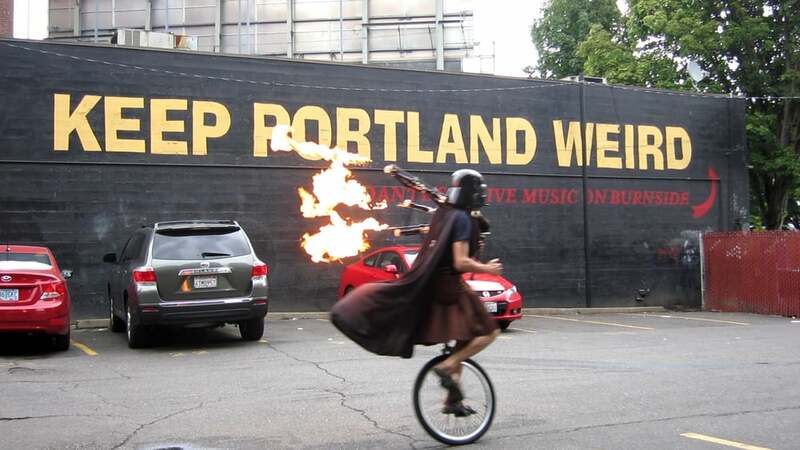 What keeps Portland weird for you? Leave your stories in the comments!